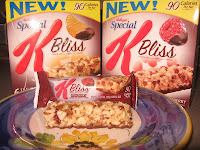 I had high expectations when I heard of the new Special K Bliss Bars, and I must say those expectations have been met with this new treat. 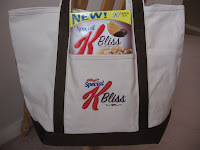 Thanks to Mom Central and Kellogg’s, I received two free boxes of Special K Bliss Bars and a tote bag to thank me for writing my own opinion in this review. The best way for me to describe this new 90-calorie cereal bar is to call it a “rice krispie treat for grown-ups”. It’s light and crunchy, coated with chocolate on the bottom, and comes in Raspberry or Orange flavors. It’s hard to believe that each Bliss Bar is only 90-calories, but it’s true! You can get the nutritional facts over on the Special K website. I indulged in these as a treat, but not in view of my two toddlers because they are just too good to share! Now for the giveaway part of this review. I’m giving away this Special K Bliss Bar canvas tote bag with two boxes of Special K Bliss Bars (Chocolatey Dipped Raspberry and Orange). I just couldn’t send you the tote bag and not the bars, so I picked them up at Kroger yesterday to make this a sweeter giveaway. The tote bag is made of a heavy-duty cream canvas material that is really roomy with a front pocket, dark brown base and straps, a velcro closure in the middle, and a clip for your keys on the inside. I’m also giving away a sort of “consolation prize” to 10 of my readers – two coupons to save 55 cents on a box of Special K Bliss Bars (so you can try both flavors). I’ll be drawing the winners using the random number generator – the first name I draw will get the tote bag and two boxes, the next ten names will get the coupons. This giveaway has ended, and the winners announced in a separate post here. Sponge cake in chocolate fondue! Soooooooo good! My favorite thing to dip in chocolate is pineapples! Oh so yummy!!!! I like a lot of foods dipped in chocolate, but I suppose my favorite would be yellow cake. my favorite food to dip in chocolate is strawberries and now they’re in season! I love to dip cubes of pound cake or cheesecake in melted chocolate..mm..mmmh!!! I love chocolate covered rice krispie treats. I too love Strawberries dipped in chocolate. bananas ,strawberries and peaches..yes,yes…thanks for a great contest. My favorite food to dip in chocolate is pretzels…the salty and sweet is delicious! I love dipping strawberries, cheesecake bites, and bananas in chocolate! Awesome giveaway! Marshmallows dipped in chocolate are delicious! My favorite is also strawberries! Love those chocolate fountains with strawberries to dip! Thanks for the giveaway. The best is Macadamia nuts or any nuts in milk chocolate!! Yum-Yum! Absolutely every fruit, sweet, or even my fingers! My favorite food to dip in chocolate is also strawberries. This is just an awesome end to a stressful day. I keep strawberries on hand for the daughter to eat for a snack and I always have some bakers chocolate on hand. I have a handy “lil dipper” that came with my crock pot. Just pop some chocolate in there and melt away! I have to agree with you on the strawberries, definitely my favorite. But pretzels dipped in chocolate are a close second! My fav is oreo cookies. I make chocolate covered ones for the holidays and decorate with sprinkles. I feel like I am getting something a little gourmet! I like to dip strawberries in chocolate. I bet I’d like almost anything dipped in chocolate though…with the possible exception of brussel sprouts! I love to dip strawberries! I would love to try these. They sound so yummy! I love to dip bananas in chocolate. Thanks! My favorite food to dip in chocolate is strawberries. Strawberries, strawberries, strawberries… great now I’ve sparked a craving… Gotta love being preggo! I don’t really see any need to dip anything in chocolate!!! !It is wonderful by itself! But if I had to choose it would be strawberries! I would have to say that strawberries are my favorite thing to dip in chocolate, but fresh pineapple is pretty good, too! I love to dip just about anything in chocolate. Bananas, strawberries, nuts, carmel…It’s all good. My favorite food to dip in chocolate has to be pretzels! Strawberries are good too, but better in whipped cream! Thanks for the fabulous giveaway!!! My favorite’s are strawberries and bananas. Thanks for the contest! My favorite food to dip in chocolate is- Pretzels. i love the sweet and salty taste. My favorite is a toss up between bananas or pound cake. My favorite thing to dip in chocolate is strawberries. So classic and yummy! My favorite thing to dip in chocolate is rice crispy treats or my finger. You “nailed it” with your Rice Krispie comment! These bars are such a tasty way to reward oursevles w/o the guilt! One thing I like dipped in Chocolate.. isn’t ANYTHING good dippe in chocolate?? LOL..I LOVE Pretzels dipped in chocolate.. sweet and salty at one time.. YUMO! I enjoy angel food cake dipped in chocolate, fondue-syle! I would have to say marshmallows! I love to dip fresh pineapple in chocolate! What a fun and yummy giveaway! My favorite food to dip in chocolate is probably wafer cookies. Not exactly dipping, but mixing pineapple into chocolate pudding magically makes it taste decadent. I don’t know if it’s the contrast or the acidity that makes it seem extra rich. What don’t I like to dip in chocolate, is a better question! I guess I would have to pick cheesecake! I love to dip strawberries in chocolate as well. when I make them I dip pretzels in any chocolate I have left over. Sharon’s entry via email “My favorite things to dip in chocolate would be apples and french fries.” French fries??? 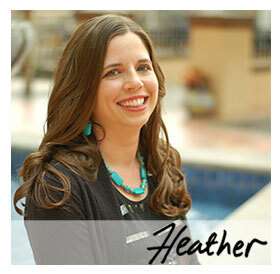 Heather’s spot is marked in this giveaway, she entered via email. I like to dip pretzels in chocolate! YUMMY! Great giveaway!Hmmm….I just so love chocolate by itself…but also like to dip fruit. I love to dip pound cake. Yummy! Thanks for the give away! I love chocolate – my favorite thing to dip in chocolate is pound cake – yum! ooh…mine is definitely strawberries! YUM. Peanut butter and chocolate…yummm!!! 🙂 Anything is yummy with chocolate!! Would love to win this giveaway! I think maybe I like peanutbutter best to dip in chocolate. You need a spoon, though…but that’s okay, it’s still yummy. Strawberries, pretzels, a spoon full of pb! I love almost anything dipped in chocolate, but I guess strawberries would be my favorite! The ultimate dip is Strawberries but…….I love the mix of sweet and salty so potato chips and pretzels are amazing dipped in chocolate. My favorite thing in chocolate would have to be peanuts!! Thank you so much for this give away!!! Yum! These look delicious! Thanks for this giveaway!My favorite food to dip in chocolate is raspberries! I would LOVE to have such a GREAT offer! I pretty much like anything if it is dipped in chocolate! I especially like peanuts and strawberries. Vanilla Ice cream, not dipped, but smothered in chocolate! Acutally, I like to take a spoon of peanut butter and dip it in chocolate chips that have been frozen. I adore chocolate and pretzels. The perfect marriage of salt and sweet! I will dip just about anything in chocolate. Except steak. Unless there is a mole sauce. Mmmm… mole sauce. I’m with you on the strawberries. But graham crackers are a close second! My favorite food t6o dunk in chocolate are Angel Food cake chunks. YUM! 1)strawberries, 2)mix in peanut butter then apples, 3)anything?? my favorite food to dip in chocolate is strawberries, #2 is bananas. Yes, strawberries are my fave. But, graham crackers are good too. My favorite thing to do is to dip chocolate into creamy peanut butter. I guess my favorite thing to dip into chocolate would be graham crackers. These look really good, I can’t wait to try them! Spoonful of jif extra crunchy!!!!! yum! tie for pound cake or strawberries! My favorite is not a DIP in, but a COVER in chocolate – since childhood I’ve loved chocolate covered POTATO CHIPS. Sound gross? They’re totally yum! Try them! Mine is a toss up between bananas, marshmallows and pound cake! Yum!! I would say that peanut butter or strawberries are my favorite foods to dip in chocolate. Can’t wait to try those Bliss bars. 90 calories – really???! Bananas – then add some chopped peanuts and freeze… You’d think you were eating a popsicle!! For christmas, I make treats with melted chocolate. I dip pretzels in chocolate and roll in sprinkles. I melt chocolate and dip spoons in for people to use in their hot drinks, and I melt chocolate and dump craisins in the melted chocolate and then pour it into a cookie sheet. Then break apart for treats. The last one gets the most raves. I’m not sure if you’ve had these before, but there are these sticks of orange goo of some sort covered in chocolate. Since moving to Michigan a few years ago, I haven’t been able to find them. The Bliss bars look really good. If I don’t win, I’m going to have to buy me a box! My favorite is food to dip in chocolate is strawberries too!! Thanks for this gieaway! Ooooh…this is making me hungry. My favorite food to dip in chocolate is oreos…what can be bad about double chocolate?! … peanuts, definately. Gosh, I’m hungry now. My absolute favorite things to dip in chocolate are pretzels. Yum! angel food cake, pineapples or strawberries. YUMMY! What a wonderful give-away. I love your Freebies 4 Mom website and am happy to report that I did manage to get in on the last Starbuck’s sample after being unsuccessful the first time it was offered. Also want to let you know the postings on the cupcakes was a wonderful idea. Thank you! My favorite thing to dip in chocolate used to be peanut butter, but now I’m not eating peanut butter – so, cinnamon graham crackers are very yummy as well as pretzels. Definately has to peanute, or peanut butter – mmmmmm!! If it’s dark chocolate even better! Strawberries will work anyday also! I love those chocolate covered pretzels. I used to make them every Christmas, but haven’t in a few years. Please enter me for the giveaway…what a great treat. I like to dip peanut butter cookies in chocolate! Yum. It’s a tie for me – strawberries and bananas are my favorite things to dip in chocolate. However, a friend dips raspberries – will have to try that! Hmmm … that’s a tough one. Cherries! … and pretzels! I love to dip Strawberries, Bananas & Kiwi in chocolate! My favourite food to dip would be strawberries, but my favourite pre-dipped food is chocolate-covered espresso beans. Mmmm..
My favorite food to dip into chocolate is frozen bananas! It tastes more decadent and fattening than it really is. Plus it takes you longer to eat. Thanks!! My favorite would be a spoon full of peanut butter… dip and enjoy. Mmm, pretzels – that salty/sweet combination gets me every time! I’m with you on the strawberries!! Nothing better than that! My favorite is white chocolate and strawberries. Yum!! I like to dip salty things in chocolate. You know those pretzels that have peanut butter in the middle… those are amazing in chocolate! I love to dip fresh pineapple in chocolate. I also love to dip marshmallows too! I love to dip the Flips pretzel/crackers in chocolate! I love to dip pretzels in chocolate! I love salty-sweet!! I like to dip cubed angel food cake (or sponge cake) in chocolate. Of course right on its heels are bananas, marshmallows, pineapple, and strawberries!!!!! i totally agree. strawberries are the BEST! 🙂 Thanks! Strawberries in chocolate are the best! my favorite food to dip in chocolate is bananas….yummmmm!Thanks for the great giveaway! Next post: *Expired* Getting Target emails? Get a Free Photo Card!